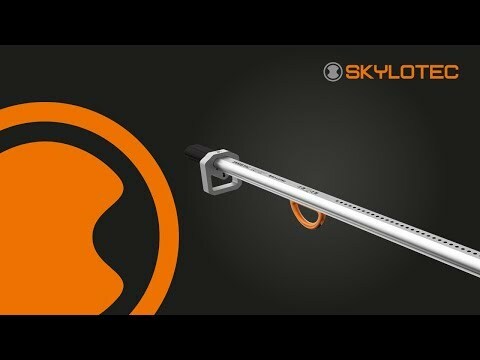 SPEED, the new patented runner for height access systems from SKYLOTEC, is ahead of its time. While work on improving the safety standard EN 353-1 for guided type fall arresters on a rigid anchor line continues, we have solved the problem: With our new runner SPEED. The principle behind SPEED is simple: The security bolt sits hidden in the housing and is protected there from unwanted access. Through an additional locking lever, SPEED works during climbing like a pull-back runner. The runner remains close to the climber and so the fall distance remains short. This creates comfort while climbing and minimizes fall-related injuries. In the case of failure of the pull-back feature, whether through mistake or unfavourable conditions, the runner can reach only a fixed preset maximum speed. Should the runner exceed this speed, an independently acting second safety feature kicks in: A centrifugal force brake swivels out and the runner blocks.